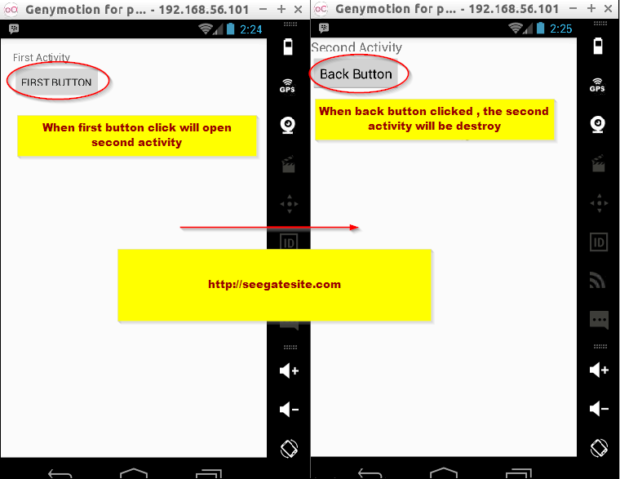 Seegatesite – continued on introduction android programming tutorial that I have discussed in previous articles, this time I will share android programming tutorial on how the button to switch between activity to another activity. In developing Android App we may be facing a situation where we need to move between the Activity (Screen) to another activity. Before further discussion, I will explain a little bit about the activity on android. What is Activity on Android ? Activity represents one screen with a user interface. For example, A Messaging application has activity inbox list, there is other activity such as create new message. Callback method defines an event, we don’t need to implement all the callback method. However, it is important and necessary to understand each function of the Callback method, so that our application can run your expectation. – onCreate() : This method was first called when the first activity begins. – onStart() : This method is invoked when the activity is already visible to the user. – onResume() : This method is invoked when the activity began to interact with the user. – onPause() : This method Called when the activity stops while not accept user input and does not execute any code. – onStop() : This method is invoked when the activity is not visible to the user. – onDestroy() : This method is called before an activity is disabled. – onRestart() : This method is invoked after the activity stopped and displayed again by the user. If you guys don’t know how to create a new project on android studio. please read my previous article Introduction Android Studio for Beginners.